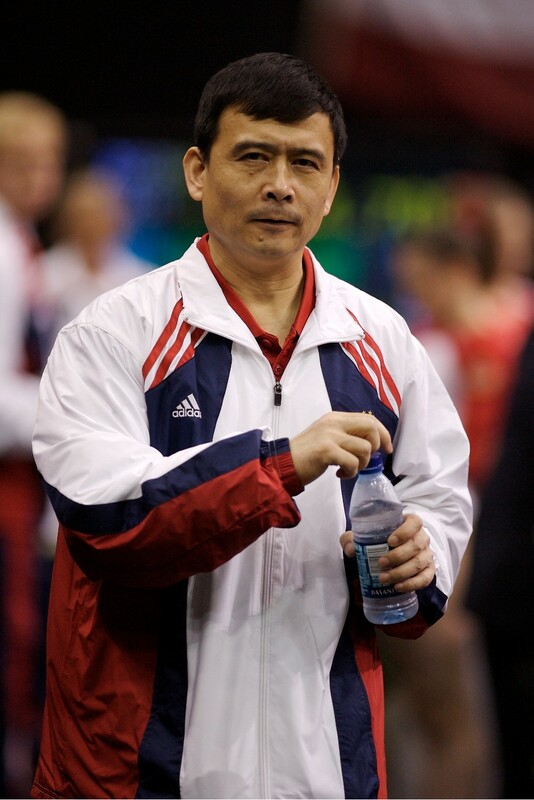 After a lot of rumors flying around, it was confirmed at a Region 5 conference last night that Sam Peszek’s coach, Peter Zhao, is returning to China, according to WWGym. This leaves Peszek at a gym with no qualified elite coach at Deveau’s in Fishers, Indiana. Rumor has it that she could go to Sharp’s, or even Chow’s. I think Peszek’s still got some elite left in her — if she didn’t, one option would be to drop to Level 10, which Deveau’s has, and prepare for NCAA. She’s clearly keeping that option open since she hasn’t accepted any sponsors. Of the other two gyms, I think Sharp’s seems more likely. It’s in West Indianapolis, which is clearly closer than Iowa, and Peszek is one of those few elite gymnasts who actually goes to a real school, Cathedral High. (On that subject, anyone who does elite gymnastics while attending a regular school is leaps and bounds above everyone else.) Peszek would be training there with Bridget Sloan, fellow 2008 Olympic team member. On the other hand, I think Peszek and Sloan have very different gymnastics personalities. But the gym is clearly right up there at her level. By contrast, I think Chow’s is less likely but would be a better fit. They are clearly a gym capable of training elites without sacrificing education. Shawn Johnson and Peszek are actually incredibly similar as gymnasts, which has become increasingly clear, especially in the next year. They’re both powerful tumblers with great, big skills. I think they would do well together. On the other hand, Peszek’s reaching the end of her high school career, so I think it’s a less likely move. ETA 9/30: It’s official on the Deveau’s Web site. ETA 10/3: Peszek will be staying at DeVeau’s, working with an as-yet-unidentified new elite coach, according to this interview. She also gives us the clearest answer (besides Sacramone, who is clearly retiring) about what she will be doing in the future: she says she is continuing in the elite program, hopes to compete at Worlds in 2009, and is eventually aiming at NCAA. Peszek with Luminita Miscenco-Garcy, her soon-to-be coach? 4 Responses to "Peter Zhao returning to China"
1 | Gymnastics Coaching » Blog Archive » who will coach Samantha Peszek? Congratulations on the new blog. It looks great. I’ve subscribed to your RSS feed. And linked from Gymnastics Coaching under BLOGS. Props on the new blog. You’ve got some great stuff on here! I linked to this story on my site, http://www.gymnastike.org, and will add your site to my links page. Chow’s would have been really neat. And her style is very similar to Shawn’s. I did not like her being part of the little Shayla clique, but hanging with Bridget (or Shawn) will be good for normalizing. That is too bad she is moving on from her first gym. It sounds like she looked into it, but it did not work out. She needs to take care of her body, preserve her elegibility and get a free college education. She is not quite good enough to really be a major world class player. And spending senior year at home makes sense. All in all, she did the right thing from a lifestyle perspective.